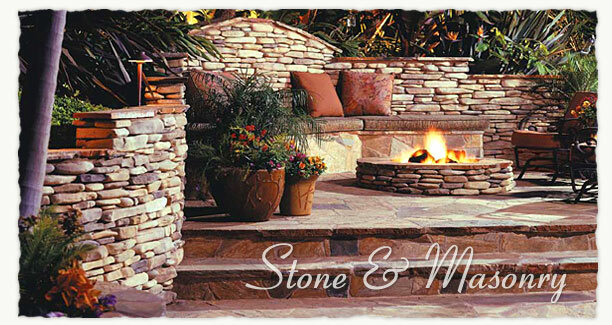 The Enhance Companies offers full service stone and masonry construction. We have many skilled masonry tradesmen that can make the dreams for your property become a reality. We are a licensed and fully insured corporation that works within all state and local codes. Our mission is to provide the highest quality workmanship at reasonable prices. Stacked stone can be applied to almost any interior or exterior vertical surface. Architectural stone veneer has all of the character and personality of natural stone and works in a wide variety of residential and commercial applications. The Enhance Companies can also meet your structural masonry application needs with every type of wall block construction. Natural stone works great to add structure and boldness to fountains, pools, or water features. Flagstone is a natural stone that comes in a variety of color ranges and is an alternative to brick paver patios.